This mixed choir is designed as a training choir for children in grades 3-5. 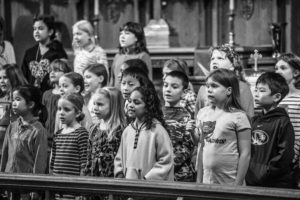 Practical application of choral music is introduced at this level in an age-appropriate, high-energy environment. Primo Choir members participate in CYC’s two major concerts, two final dress rehearsals, and an outreach performance. No past musical experience is required. Primo Choir meets August 26 – December 2 and February 3 – May 5.